The Litany of Re (or more fully "Book of Praying to Ra (Re) in the West, Praying to the United One in the West") is an important Ancient Egyptian funerary text of the New Kingdom. Like many funerary texts, it was written on the inside of the tomb for reference by the deceased. Unlike other funerary texts, however, it was reserved only for pharaohs or very favored nobility. It is a two part composition that in the first part invokes the sun, Ra, in 75 different forms. The second part is a series of prayers in which the pharaoh assumes parts of nature and deities but mostly the of the sun god. Developed in the Eighteenth Dynasty, it also praises the king for his union with the sun god, as well as other deities. The text was used in the entrance of most tombs from the time of Seti I, though we first know of it form the burial chamber of Thutmose III and his vizier Useramun. The Litany of Re was a special composition that, at least a portion of which, was inscribed in the tomb of Tuthmosis III and the tomb of his vizier, Useramun. These excerpts evidently related to each other. Though the series of figures to the "Great Litany" also appear in both tombs, there are no further illustrations. We actually find the first occurrence of the whole composition, are mostly whole for there are a few omissions, on the shroud dedicated by Amenhotep II to his father, Tuthmosis III (without illustrations). P> Interestingly, the composition then disappears until the reign of Seti I, in whose tomb we find for the first time the figure related to the title. 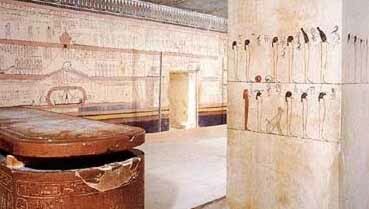 Interestingly, the composition could have also been found in the tomb of Amenmesse, but Seti II ordered it hacked from this location in order to harm him in the afterlife. Afterwards, the book becomes a standard motif in the first and second corridors, indicating its importance, of the royal tombs. However, Ramesses VI omits the text from his tomb, while Ramesses IX (tomb) and X (tomb) only include extracts in theirs. Normally, the depictions were always reserved for the second corridor, while the text was inscribed in the first corridor, sometimes spilling over in the second. In the tombs of both Kings Seti I and Ramesses II (tomb), all of the hieroglyphs face the interior of the tomb, while we find in the tombs of Merneptah on, they uniformly face to the right so that all the columns of text are reversed. In the Late Period, we also find depictions of the Litany of Re in tombs, such as those of Mentuemhet, Petamenophis and Ibi. Outside of tombs, we also find portions of the figures in the decorations commissioned by Merneptah in the Osireion of Seti I at Abydos, together with a complete sequence in the temple built by Ramesses II at that site. By Egypt's Late Period, we also find the depictions actually inscribed in temples, such as the edifice of Taharqa and the chapel of Hakoris at Karnak, as well as extracts in the Nilometer at Roda. Certain passages from the Litany of Re were also adopted for the Book of the Dead. By the 18th Dynasty, excerpts from the composition were used as spell 127 (beginning with the manuscript of Maiherperi dating to the reign of Amenhotep II), and as spell 180 in the early 19th Dynasty, beginning with the sarcophagus of Seti I. Spell 127, addresses the "gods in the caverns" and associated them with the guardians of the gates of the netherworld. Here, we also find the only mention of the Place of Annihilation in the Book of the Dead. Later, we also find spell 127 is in the tombs of Ramesses IV (tomb)and Ramesses VI. Spell 180, which begins with the central verse, "It is Re, who rests in Osiris", is attested on the coffin of Seti I and in part at the Osireion. In addition, it is also found in the tomb of an official (TT3) and on papyri (Qenna, Neferrenpet, Louvre 3073) from the end of the 18th Dynasty and the beginning of the 19th. It should be noted that the familiar depictions of the ram- headed Re-Osiris found in the tomb of Nefertari and others of the 19th Dynasty were actually a part of the spells of the Book of the Dead and not the Litany of Re. In contrast, the Books of the Netherworld are never found in the Book of the Dead, except for the special case of spell 168. It was Richard Pococke who published a very early description of the Litany of Re discovered in the tomb of Ramesses IV, but text editions of the composition were actually among the earliest publicized by Egyptologists. As early as 1869, Edouard Naville investigated the text in the tombs of Seti I and Ramesses IV, publishing a translation into French in 1875. He also published an English translation in 1876. Thereafter, for almost a century, his references became the standard for scholarly study of the Litany of Re, though in 1936 Hermann Grapow published a paper on the text and depictions. In 1964, Alexandre Piankoff again published the composition, but included no hieroglyphic text, though he did include photographs from several tombs, including those of Seti I and II together with the shroud of Tuthmosis III. His work included a translation into English. The latest full, scholarly work appears to have come from Erik Hornung, a German who included all the New Kingdom versions in a commentary volume in his edition of 1975. Though many of the Books of the Netherworld do not include an original title, in the tomb of Useramun we discover that the old Egyptian name of this composition was the "Book of Praying to Re in the West (or Book of Adoring Re in the West), Praying to the United One in the West". Here, there are also remarks regarding the manner of recitation and efficacy of the text. The composition begins with the Great (or large) Litany, where the sun god is invoked a total of seventy-five times in various names and forms. Each invocation begins with "Praise to you, oh Re, great of power". After the Great Litany, eight more follow but only the sixth section is composed in verse. In fact, the structure of the remaining text is often unclear, as only the litanies are distinctly separated because of their unique initial refrains. The early content of the composition contained the divine figures that illustrate each of the invocations. From the earliest examples, these depictions were divided so that they alternate in two series. For example, they face each other on the north and south walls of the tomb of Useramun, though in the Ramesside tombs they are on both walls of the second corridor, with the left wall being dominant. Hence, the illustrations alternate up to the 51st invocation, with the odd numbered figures on the the left and the even numbered figures on the right. However, this structure is interrupted by two successive figures (51 and 52) on the left and two (53 and 54) on the right. Afterwards, the alternation continues, though now in reverse order, with the even numbered figures on the left and the odd numbered figures on the right. Each invocation is illustrated by the figure of a god, with the 76th figure that of the ba of Re, as a ram's head in the red disk of the sun. Most of the figures appear in a mummiform state, with a few in the form of animals, such as the ram and scarab beetle as the two main figures of the sun god and the "Big Tomcat" that embodies his punishing aspect, and the "Divine Eye". Structurally, by dividing the 75 invocations into three divisions of 25 each, we recognize special emphasis on the 26th and the 51st figures. The figures may also be grouped in divisions of ten each, with the first ten differing in structure from the rest, while the following group of ten is reserved for an extended Ennead.The union of Re and Osiris receives special treatment within the composition, and the two sequences of figures are constantly divided between them. The figures of Osiris are found only in the sequence on the left, while the right side consists of many scarab beetles. The left side also includes figures of Atum, the ba of Re and the Great Cat. The names and and the figures that are depicted are the most important forms and attributes of the sun god while in the netherworld. Hence, we find the Khepri (three times), his morning form, Aten, his evening form, the ba of Re, together with his various ram forms, as well as his forms of cat and child, the divine Eye, the sun disk and the accompanying figure of a baboon. The remaining gods and goddesses of the Ennead are also present, though here, Seth is replaced by Horus. Nun and Tatenen, primeval gods of representing the depths of water and earth, are also present. We find Osiris only as Khentamentiu, though two names refer to the union of the two gods, which represents a central theme of the entire litany.Re's association with the netherworld is emphasized by several names, including "he of the netherworld", "he of the cave", "he who has command over his cave", "he who renews the earth", and "he of the West". Several other names portray his journey through the netherworld and in the concluding text of the composition, he is even called "migratory bird". Since death and rebirth are both represented in the composition, rejoicing and mourning are also present and some names reference the corpse of Re, and even the corpse' decay, which must precede his rebirth. He is called "The Weeping One", referring to the theology of human beings emerging from the tears of he creator god, and as a corpse, he is "He in the Sarcophagus" The double aspect of the sun during the night hours is presented. He is referred to as "The Dark One" or "The One with the Dark Face", but also as "The Shining one" whose rays are longed for by the dead. Re's beneficent deeds for the blessed dead, as well as his function as in punishing the damned are represented, for he is "The One Who Enchains" and "The One from the Cauldron and generally "The One who Destroys his Enemies". He is also the one who "has arranged the heat in the Place of Destruction". Even as early as the tomb of Useramun, additional depictions augment the divine figures. Here, the vizier actually placed his own figure at the end of both sequences, and even his wife and other family members are represented at the end of the left-hand sequence. In the tomb of Tuthmosis III, where the two sequences cover the two pillars of his burial chamber, he had himself and female members of his family depicted on an adjoining side of one of the pillars. At Abydos, Ramesses II expanded the sequence in his temple to include even royal ancestors, consisting of his parents and grandfather, as well as Ahmose, the founder of the New Kingdom. However, like Merneptah in the Osireion, Ramesses II is only presented making offerings to the them. For the first time in his version, the figures also contain a small sun disk to indicate the presence of the sun god within them. For the first time in the version of the composition found in the tomb of Seti I, an additional "title" illustration (figures 85 and 87) are inserted between the title of the book and the Great Litany. The central depictions is of a scarab and a ram headed god, both contained within a disk. Above are a serpent and an antelope, while a crocodile and an antelope are depicted below. Though these illustrations are problematic, John C. Darnell suggest that the animals have been dispatched by the sun god against his enemies. Thus, they may act as his bodyguards. However, Erik Hornung, perhaps more correctly, sees them as enemies fleeing from the sun god. Strangely, a representation of the united Re and Osiris was added in the tomb of Nefertari (figure 86). Not a part of the actual Litany of Re, it rather belongs to spell 180 of the Book of the Dead. This illustration also appears in the tombs of some royal officials dating to the 19th Dynasty, as well as QV40, the tomb of an anonymous queen in the Valley of the Queens. Though the hours of the night play no part in this book, it should be noted that the number twelve seems to have significance throughout. The Litany of Re is a description of, and praise for the deity who descends into the netherworld at night and meets Osiris as the ruler of the netherworld and of the dead. Its theme is the direct equating of the deceased pharaoh with the sun god Re, with his ba-soul which is actually that of Osiris, and with the daily course of the sun. Re, combined with the ba of Osiris as one god, who "speaks with one mouth", awakens the dead to renewed life, as well as caring for the blessed and punishing the damned. Though not actually a part of the Litany of Re, this ram- headed Re-Osiris is found as an addition in the tomb of Nefertari. The host of figures and functions of this nocturnal sun god in the Great (or large) Litany opens the way to the netherworld for the deceased. There is also a desire to include the dead king in the course of the sun, therefore providing him with daily renewal. The deceased king expresses this desire as "My birth is the birth of Re in the West". The connection with the course of the sun is why the text accompanying the union between Re and Osiris is included in the illustration of the Book of the Dead spell 109, where the sun is called a "newborn calf" in the tomb of Arinefer (TT290). As a migratory bird, Re visits the netherworld each night and, like all of the dead, becomes as he is called in the concluding text of the Great Litany, a cavern dweller. Afterwards, the deceased speaks for the first time, indicating that he has a complete understanding of Re's nocturnal forms of manifestation, together with their names. He implores them to open the netherworld to him and his ba. This is one aspect of the Litany of Re that distinguishes it from the Books of the Netherworld, for in those compositions the deceased never speaks. In the Books of the Netherworld, the dialogue is always between the sun god and the inhabitants of the Beyond. After the Great Litany, the second litany follows with the inhabitants of the netherworld, who are commanded to prepare the way for the dead as they follow Re. Interrupted by only an invocation to the nocturnal sun, "who shines among those in the netherworld", the third litany adds, "May you lead me to the ways of the West:". This leads into the first equations of the deceased, first with Nun and then with Re, his ba and his cycle. On the ceiling the text that follows invokes the United One and equates the dead with his ba and corpse. Hence, this is a very important section of the composition because of the way it is inserted as well as its content. Here, there is a remark about recitation that makes reference to the forms of the gods and to the offerings they require. Next, the deceased king presents a speech addressed to them as the "gods who are in the West". He tells them that "I am one of you", and thereafter identifies himself with the sun god with whom he shares the triumph "over all his enemies in the sky and on earth". Afterwards, the short fourth litany consisting of three double verses wherein Osiris is also addressed. Here, Re and Osiris greet and extend their hands to one another. Through the power of his ba, Re displaces the darkness allowing the netherworld to see as the deceased also seeks the renewal of his eyes and the return of his heart. The fifth litany consists of eight double verses. Here, "You have commanded for me, as (for) Akhty", is a general evocation of the care of the god. Afterwards, there is a prayer asking for deliverance from the slaughterers in the netherworld, including their cauldrons, their traps and their ovens, because "I am Re". After a depiction of the majestic appearance of the god as ba with the request, "Oh Re, come to me, oh guide" and some further identifications and dialogues with the "weary of heart" in the netherworld, there is the sixth litany containing fifteen double verses Here, we find the representation of a pelican goddess, perhaps representing the embodiment of Nut, the goddess of Heaven, who is suppose to care for the deceased. Now the deceased makes his appearance in all the splendor of the sun god. Five double verses make up the seventh litany where, "Truly you have caused me to ascend" is followed by the "Member Apotheosis". In this litany, the dead king's limbs are deified as every part of his body is equated with a god, allowing the deceased to become "entirely a god". Afterwards, the king also appears as the god's son and receives commands from him. Now, in a double role as Re and Osiris, he turns to those who dwell in the netherworld, those who are "provided with offerings", and this section ends with the rejoicing of the eighth litany, "hail, well led...". The composition ends with a prayer to the realm of the dead as the "West" in the ninth litany where there is a final identification of the deceased king as Re. Towards the end there is an old formula where the ba belongs to the sky and the corpse to the earth, with the additional phrase "among the gods".